OSAKA, JAPAN — March 2018 — Nihon Superior Co. Ltd., an advanced joining material supplier, today announced that its President Tetsuro Nishimura has received a Distinguished Committee Service Award in recognition and acknowledgement of his extraordinary contributions to IPC and the electronics industry. 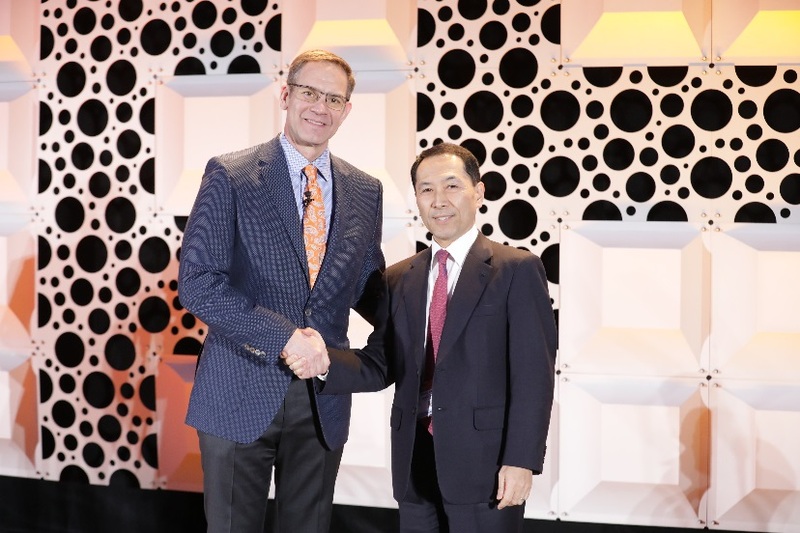 IPC – Association Connecting Electronics Industries® presented the award at the recent IPC APEX EXPO that took place at the San Diego Convention Center. 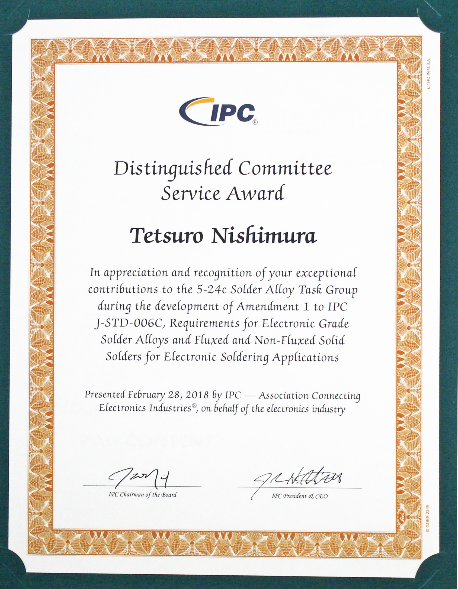 Nishimura received the award for his contributions to the 5-24c Solder Alloy Task Group that developed Amendment 1 to J-STD-006C. He was recognized for making significant contributions to IPC and the industry by lending his time and expertise through IPC committee service. Nishimura recognized throughout the electronics industry as the inventor of SN100C and the pioneer of micro-alloyed solders. In addition, since his promotion to President in 2004, he has overseen the expansion of Nihon Superior to its current position as a major supplier of lead-free solder to the global electronics industry. For more information about the Distinguished Committee Service Award and other awards presented at IPC APEX EXPO, contact Sandy Gentry, IPC communications director, at +1 847-597-2871 or SandyGentry@ipc.org. Nihon Superior continues to offer solutions to the challenges facing the electronics industry, such as improvements in reliability, thermally stable joining, and lead-free die attach. For more information about Nihon Superior’s new solder pastes and lead-free products, visit www.nihonsuperior.co.jp/english. About Nihon Superior Co., Ltd.
Nihon Superior was founded in 1966 when it began marketing unique flux products imported from the US. The company made its mark on society by gathering the most advanced soldering and brazing technologies and products from around the world, and supplying them to companies in the metal-joining industry. A turning point for the company came when it started developing its own soldering materials and with the success of its unique SN100C lead-free solder alloy Nihon Superior has become a major player in the global market. To support the growing demand for its products, Nihon Superior has established manufacturing and sales centers in Japan, China and other Asian countries, and the United States, and formed business partnerships with companies in other markets.